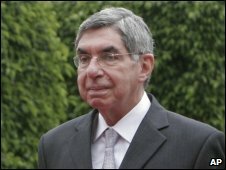 Costa Rican President Oscar Arias has announced that he has swine flu. "Apart from the fever and a sore throat, I feel well and in good shape to carry out my work by telecommuting," the 68-year-old said in a statement. The president is receiving medical care at his residence and is expected to remain there for a week, his brother and chief of staff Rodrigo Arias said. He had been mediating talks on the Honduran crisis, after President Manuel Zelaya was toppled in a coup in June. But the negotiations broke down two weeks ago, and Mr Arias's brief absence is not expected to affect the outcome. The Nobel Peace Prize winner, who suffers from chronic asthma, is the first head of state known to have contracted the H1N1 influenza virus. He was diagnosed with a mild case of swine flu on Tuesday after having flu-like symptoms for some days. More than 20 people in Costa Rica have died as a result of the swine flu outbreak, which was declared a pandemic on 11 June by the World Health Organization.